(the Powder River, Wyoming) were Midwestern rivers, so his results may best represent that region. Guild proportions were very similar across basins, except for the Powder River where detri-tivores were many and piscivores absent. Plankti-vores were absent from headwaters and piscivores increased downstream; otherwise the downstream increase in species richness was unrelated to changes in trophic representation. Combining the relevant categories from Hor-witz' study, less than 20% of the species subsisted on a diet of plant and detrital material. Herbivory is not common among the stream fishes of North America, where only about 55 of over 700 total fish species are primarily herbivorous. However, some introduced species, including the grass carp Ctenopharyngodon idella, illustrate that herbivorous fishes can be effective grazers of macrophytes, despite the limitations of a diet of living macrophyte tissue. Grass carp daily rations (in wet mass of macrophyte tissue) range from 50% to over 100% of their body mass per day, indicating that this feeding strategy is based on processing a high volume of material. Furthermore, the grass carp's preference among nine macrophyte species native to the Midwest was not correlated with measures of plant nutritive value. Instead, preferences appeared to reflect relative handling times, allowing fish to maximize "throughput" (Wiley etal. 1986). Grass carp also are known to have a low metabolic rate and assimilation efficiency relative to other fishes, and to require animal protein for proper growth. Many primarily herbivorous fishes are really omnivores even though the majority of their diet is plant matter, because animal prey, detritus, and organic-rich sediments frequently are consumed as well. 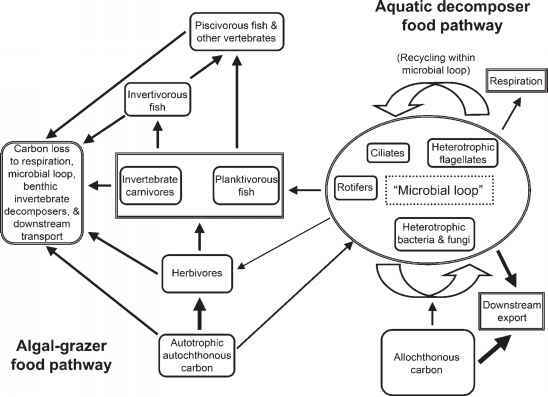 Quantitative evaluation of the diet of central stone roller minnows C. anoma-lum in a tallgrass prairie stream showed it to derive the majority of its growth from consumption of algae (47%), followed by amorphous detritus (30%), animal matter (21%), and leaves (2%) (Evans-White et al. 2003). In Río las Marias in the Andean foothills of Venezuela, the grazing armored catfish Chaetostoma milesi and the de-tritivore Prochilodus mariae both consume algae and detritus, and benefit from the organic fraction of consumed fine sediments (Flecker 1992a). Detritivory usually is a minor feeding role for fish in temperate rivers, but in tropical rivers, especially the great rivers of South America, the ingestion of dead organic matter can support the bulk of fish biomass (Bowen 1983). Special adaptations include a muscular stomach to grind food and an intestine with greatly increased absorptive surface due to elongation (up to 20 times body length) or elaborate mucosal folding. Because of their high contribution to biomass, detritivorous fishes play an important role in food webs, linking C originating in detritus both to piscivorous fishes (Winemiller 2005) and human fishers (Bar-barino Duque et al. 1998, Bowen 1983). While some fish can be placed in a trophic guild without difficulty, others cannot, due to their morphological specializations, flexibility in feeding habits, and changes that occur over an individual's life cycle. Within the sucker-mouthed armored catfishes (Loricariidae), Rhi-nelepis aspera feeds on fine-grained detritus using suction to obtain food, and possesses long gill rakers, rudimentary labial and pharyn-geal teeth, a thin stomach wall, and a long intestine (Delariva and Agostinho 2001). In contrast, Megalancistrus aculeatus and Hypostomus microstomus feed on coarser material including periphyton by scraping the substrate and have large, spatulate teeth, short gill rakers, a well-developed stomach, and a shorter intestine. The feeding biology of sunfishes (Centrarchidae) illustrates how specific functional features can underlie differences in feeding performance and diet among taxa, including the jaw opening and closing systems, size of the mouth, and size of muscles used in prey-crushing behaviors (Wainwright 1996). Piscivores tend to have larger mouth gapes (Mittelbach and Persson 1998), and molluscivores have crushing teeth that can vary in their effectiveness against hard- versus soft-bodied prey (Huckins 1997). Body shape also influences prey choice through habitat use and swimming ability. Among young fish from the Sinnamary River, French Guiana, disciform taxa fed mainly on aquatic insect larvae and terrestrial insects, most anguilliform taxa ate insect larvae, and those with an intermediate morphotype had varied diets ranging from plant debris to fish (Merigoux and Ponton 1998). Ecomorphological analyses of entire assemblages have documented a strong relationship between the ecological role of fishes and their anatomical features. Gatz (1979) examined 56 morphological features of 44 species seined from North Carolina piedmont streams, calculated 3,080 pair-wise correlation coefficients among characters, and then used factor analysis to look for associations among characters. The first four factors together accounted for 60% of the variance in the correlation matrix. Factor 1 separated "lie-in-wait" biting predators from cruising suction feeders; factor 2 reflected the differences in body shape and proportions associated with habitat use; factor 3 separated a benthic from midwater lifestyle; and factor 4 separated small insectivores with short guts from other fishes. Ecological correlates of these factors indicate that morphology does indeed influence or reflect diet and habitat preferences. Fishes with flat, deep bodies were associated with slow water habitats. Fishes with ventral mouths obtained relatively more food from the bottom; those with terminal or anterior mouths did not. Fishes that dwell on or near the bottom in fast water regions had reduced swim bladder volume, and relative gut length was greatest in mud feeders, to list some principal findings. Eco-morphological analyses of tropical fish assemblages also have successfully related food and habitat partitioning to differences in body plan, discussed further in Section 9.3.1.3. In addition to the morphological specializations just described, the sensory systems of fishes are strongly attuned to environmental constraints on food acquisition. River water varies in clarity, perhaps nowhere more evidently than in the Amazon basin. Whitewater streams are heavily colored by their alluvial loads, while blackwaters carry little silt but are darkly stained with dissolved material. Typical Secchi disk readings are <0.2 m in the former, 1-1.5 m in the latter (Muntz 1982). Clearwater rivers carry comparatively little silt or dissolved organics, and light penetration often equals or exceeds 4 m. These are markedly different visual environments. Absorbance of short-wavelength light is relatively great in fresh water, and more so as light penetration is reduced. Levine and MacNi-chol (1979) examined 43 species of mostly tropical freshwater fishes, and divided them into four groups on the basis of visual pigments. Species with strongly "short-wave-shifted" visual pigments were primarily diurnal, and fed from the surface or in shallow waters. Several species exhibiting the typical behavioral and morphological characteristics of catfishes lay at the other extreme. Their visual pigments were the most long-wave sensitive; in addition, they were primarily benthic and probably foraged either noc-turnally or in very turbid waters. Rodriguez and Lewis (1997) determined that transparency was a very good predictor of fish species composition in floodplain lakes of the Orinoco River. In turbid lakes, fishes with sensory adaptation to low light like catfishes and knifefishes were dominant, whereas visually oriented characiforms, cichlids, and clupeomorphs were typical of clear lakes. Extension of the guild structure for temperate zone fishes to the tropics is at best very tentative. Large tropical rivers that have not been regulated by reservoirs have extensive lateral floodplains where much fish production occurs in seasonally inundated habitat (Welcomme 1979). Allochthonous inputs are of great importance in these systems; consequently there is a greater role for mud and detritus feeding (which often supports the greatest biomass of fish), and for predation (which often dominates species richness). The extensive flooded forests of the Amazon make available a wide variety of food items including seeds, nuts, fruits, flowers, leaves, monkey feces, numerous terrestrial invertebrates, and the occasional vertebrate (Goulding 1980). Diversity of resources obviously contributes to diet diversity, and special feeding adaptations further increase the variety of feeding roles. Large characins such as the tamba-qui (Colossoma) have evolved broad, multi-cusped molariform teeth in order to crush hard nuts. A number of unrelated taxa eat particular parts of other living fishes, including scales, skin, fins, gill filaments, and eyes, as well as whole chunks of the body (Roberts 1972, Sazima 1983). Morphological specialization in these carnivores includes sharp, forward-directed cutting teeth, and behavioral specialization such as aggressive mimicry. Despite considerable specialization of dentition, jaw shape, body form, and alimentary tract, many tropical fishes nonetheless display considerable flexibility in their diet, due largely to changes in habitat and food availability driven by seasonal fluctuations in water level. In the Apure and Arauca rivers, two tributaries of the Orinoco River, the catfish Pseudoplatystoma hemioliopterus is primarily piscivorous, while in the Amazon basin, fruits and seeds have been found in their stomachs (Barbarino and Winemiller 2003). Goulding (1980) reported that piranhas ingested mostly seeds and fruits during the flooded period. Seasonal comparisons in a small Panamanian stream (Zaret and Rand 1971) revealed greater diet overlap in the wet compared to the dry season. Reduced food levels in the dry season evidently led to greater habitat and food specialization in that study, and Winemiller (1991) also reported strong food and/or habitat specialization among predatory haplochromine cichlids in the Upper Zambezi river basin during the annual period of falling water levels. America, migrates during the period of high water from less productive blackwater rivers to the more productive floodplains of the Orinoco and Amazon to feed and spawn. Early in the dry season the juveniles migrate upstream into the blackwater rivers where they are consumed by piscivores like Cichla temensis (Winemiller and Jepsen 2004). The migratory movements of Semaprochilodus thus constitute a longitudinal energy subsidy, transferring C accrued in the more productive floodplain systems into less productive blackwater rivers. To a greater degree than is seen in temperate zone studies, the proportional representation of guild categories in tropical rivers varies among sites. In the Río Machado, a large, nutrient-poor clearwater tributary of the southern Amazon with extensive inundation forest, autochthonous plant food was sparse or absent and thus grazing on periphyton, plankton feeding, and consumption of aquatic herbaceous vegetation were unimportant (Goulding 1980). Quite a different result was obtained in a dry-season study of feeding guild structure in nine small (1-6 m wide) Panamanian streams lying mostly in mature forest, but including some disturbed land (Angermeier and Karr 1983). Seven feeding guilds incorporating 26 fish species were identified by cluster analysis of computed diet overlap. Mud feeders and planktivores were absent and algivores were well represented, in marked contrast to the Río Machado and quite reasonable for small streams with primarily coarse substrate and well-defined channels. The distribution of guild biomass varied with habitat and stream characteristics, including a trend toward fewer aquatic invertivores and more algivores with increasing stream size. Still further downstream, one finds the floodplain fauna with its preponderance of mud-eaters. Inundation forests support a diverse assemblage of fruit and seed feeders, but these ecosystems are uncommon outside South America, perhaps because of past human modification of inundation forests in other parts of the world. Fish body size has an influence upon diet but it is difficult to generalize about diet from size alone, or to distinguish between temperate and tropical faunas. Often a greater proportion of large species are piscivorous, as illustrated by the trophic composition of the fish species of various inland waters of West Africa (Figure 8.11). However, the largest freshwater fishes include representatives of all trophic categories. The Mekong giant catfish (Pangasianodon gigas), believed to be the world's largest purely freshwater species at 300 kg, is a detritivore, as are the giant sturgeon (such as Huso dauricus, with a maximum reported weight of 1,000 kg in inland seas). The giant arapaima (Arapaima gigas) of South America is a piscivore that reaches 200 kg, and other large-bodied species include the omnivorous carp of India (e.g., Catla catla), and the herbivorous tambaqui (Colos-soma macropomum) of South America.